A new website and brand identity for an end-to-end service for residential moves. In Place is an all woman-owned and operated company that helps people move from one home to another by making the move process simple, streamlined, and easy from start to finish. The process of moving is fragmented, stressful, anxiety-ridden, and overwhelming for many people. The client’s goal was to make the move process as stress-free and easy as possible, and reflect these qualities in their new brand. The former company Carefree Moves mainly targeted retired seniors who were downsizing their homes. With the change in ownership, the new owners wanted to rebrand themselves with an updated look and expand their service offerings to appeal to a wider audience. My client needed a new company name, brand identity, and website. I designed, tested, and launched a new brand and fully functional website for In Place to market their business and increase their brand awareness across the Bay Area. View the final In Place website. In Place sought to differentiate itself from competitors through a brand identity that was clean, inviting, and refined. 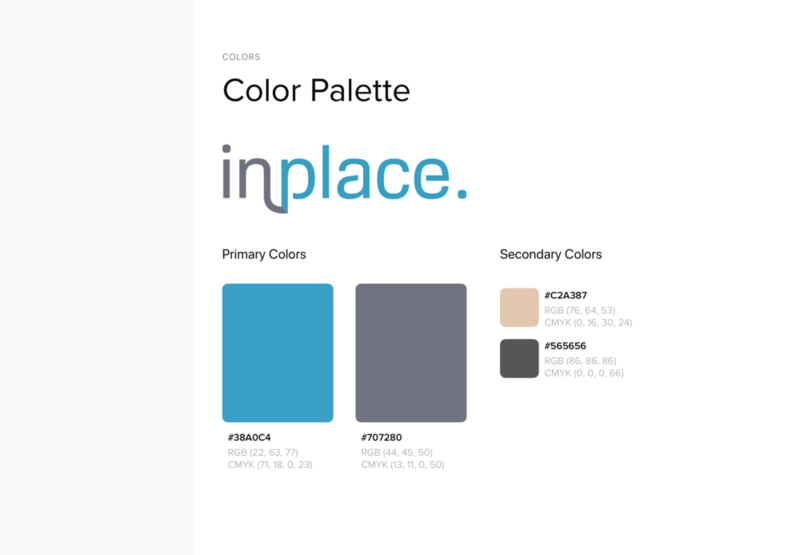 With these attributes in mind, I designed a new logo, color palette, typography and iconography. I then created formal brand guidelines and a cohesive design system that elevated their brand to the next level. I designed business cards, email templates, car decals, and flyers to complete the brand identity for In Place and enable them to connect with potential customers. To begin my research, I conducted a brand audit of the former Carefree Moves website and competitor brands to understand the moving landscape. The current Carefree Moves site is laid out in a vertical scroll that is lengthy and text-heavy. 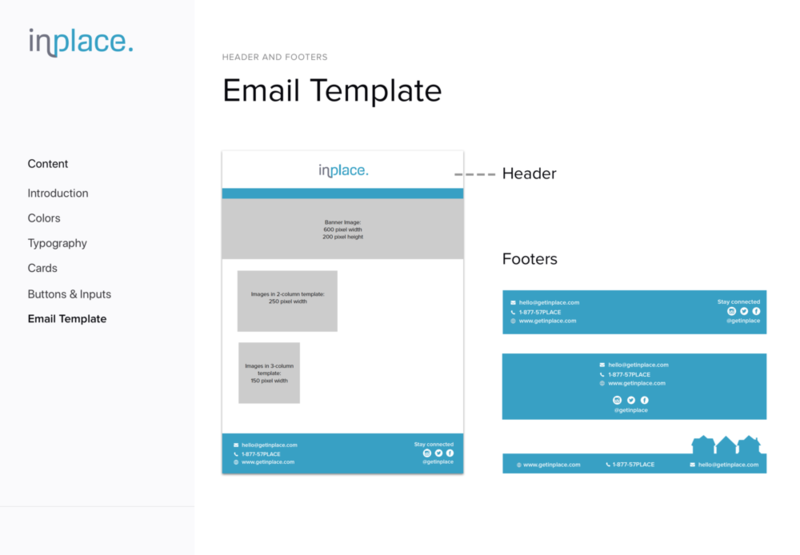 Some initial user testing revealed that this format was overwhelming and hard to navigate; people didn’t know where to go to find the information they needed. Researching competitors revealed a wide array of brand attributes across moving/organizing companies, ranging from local companies with a whimsical/cartoony brand to large corporate chains with a professional/detached vibe. After mapping competitors along a brand matrix, I discovered an opportunity area to create a new brand that felt inviting, local, and sophisticated. Common attributes: They were busy working professionals who didn’t have the time or energy to coordinate moving homes themselves and wanted professional help to ease the process. Created 35+ content cards containing tasks and information that a customer could find on the website. I pulled content from the old Carefree Moves website and competitor sites. Tasks were grouped and labeled in distinct phases: packing/unpacking, moving, organizing, and other. A final color palette of blue, gray, and camel emerged from these boards along with logo explorations. Halfway through logo development, we received mixed user feedback on the name “Fresh Start,” so we tested and finalized “In Place” as the new company name and logo. Based on card sorting results, I designed a basic information architecture to prioritize content in a way that made the most sense to users. I then created preliminary wireframe sketches of each web page to help the copywriter visualize sections for written content. Next, I tested website mockups with another set of potential customers and discovered several insights that improved overall navigation and content structure. I reduced whitespace between sections to encourage scrolling, experimented with taglines, and made calls to action clear and prominent. Along the way, I encountered roadblocks with Squarespace. We chose this CMS so my client would be able to maintain the site without extensive technical knowledge. However, the template had limitations and I had to work around them by coding additional HTML/CSS to achieve the optimal look and feel. The final website can be viewed here. 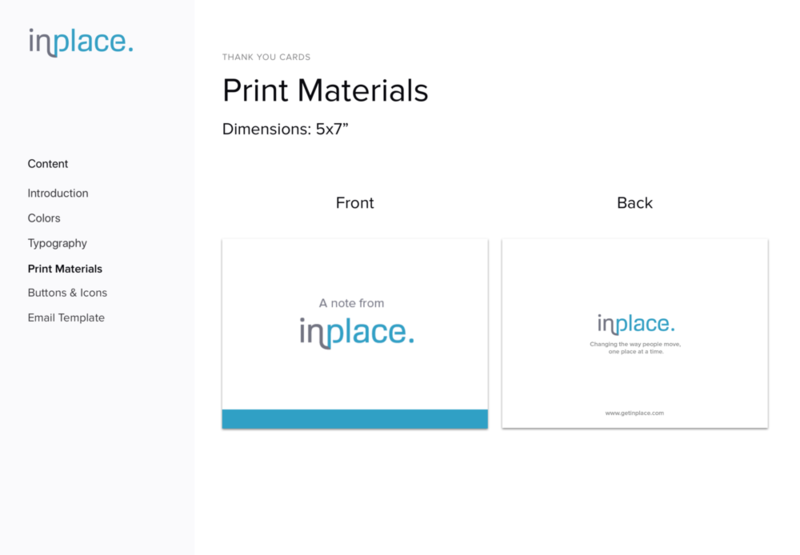 The In Place website and new brand launched mid-February 2019 and is receiving a positive response. My client is very happy with the results and will continue to report back on the impact on new customer acquisition and ongoing engagement. My clients have extensive experience in the business and a distinct point of view, so it would have been easy to default to designing solely for the client. However, as a UX designer I needed to advocate for the customer during each step of the design process in order to create a truly user-centered experience. Through card sorting and usability testing, I was able to show my clients the value of both qualitative and quantitative user feedback to design a site that is useful, engaging, and easy to understand for their customers.